The Democracy Alliance, a secretive leftwing dark money donor network whose members each direct hundreds of thousands in funding to progressive groups, are set to ramp up efforts to elect far-left prosecutors across the nation, according to documents obtained by the Washington Free Beacon. The documents, which were gathered from the Democracy Alliance's three-day fall investment conference last week at the posh La Costa Resort in Carlsbad, Calif., show that electing ultra-progressive prosecutors in cities across the country is of high importance to the deep-pocketed donors as part of their "resistance" efforts and 2018 strategy. Closed events were held at the summit on issues ranging from using the state of California as a progressive template to expand elsewhere, to the "importance of prosecutor races." "Progressive prosecutors are winning—from Florida to Pennsylvania, Texas to Illinois," a flier for a session reads. "Bold reform candidates have been propelled by movement players and driven record voter turnout of African Americans, Latinos, and Millennials—and are shifting the political narrative." 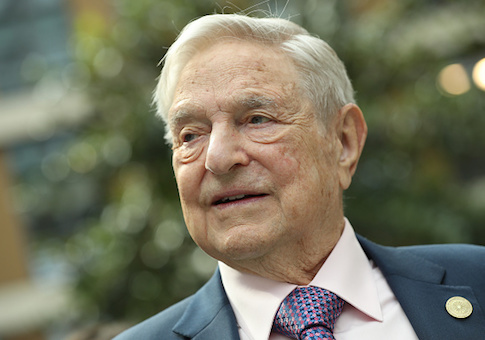 Liberal billionaire George Soros, a cofounder of the Democracy Alliance, was listed as a host for the event which shared an "early peek at more than 30 hot races" that overlap in key 2018 battlegrounds. Soros has quietly flooded prosecutor races with large sums of money as part of his efforts to "overhaul" the U.S. justice system. Larry Krasner, a progressive defense attorney who in early November was elected district attorney in in Philadelphia, is the most recent victor financially backed almost exclusively by Soros. Krasner, who previously represented Occupy Philadelphia and Black Lives Matter and has sued the police department more than 75 times, joked he had built a career that had made him "completely unelectable." Despite this, he made his way out of a deep Democratic primary of eight opponents and defeated Republican prosecutor Beth Grossman by more than 40 points. Soros funds prosecutor races identically in almost every city he targets: The financier establishes super PACs, pours money into them, refunds himself the remaining funds at the conclusion of the race, and then shuts them down. Soros established the Philadelphia Justice & Public Safety PAC and poured nearly $2 million into it with the sole intent of backing Krasner. Soros so far has pushed millions into district attorney races in Ohio, Florida, Illinois, Mississippi, Louisiana, Texas, and New Mexico. 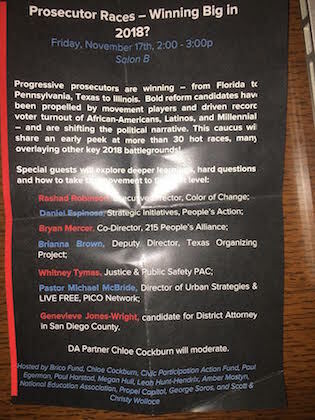 Whitney Tymas, who acts as treasurer of the Soros prosecutor PACs, spoke on the prosecutor races at the summit alongside several liberal activists. The conference was headlined by speeches from Soros, who was introduced by video message from Sen. Kamala Harris (D., Calif.) and House Minority Leader Nancy Pelosi (D., Calif.), according to the group's private memo obtained by the Free Beacon. DCCC Chair Ben Ray Lujan (D., N.M), CNN contributor Van Jones, Center for American Progress CEO Neera Tanden, Pennsylvania Gov. Tom Wolf, and Virginia Gov.-elect Ralph Northam, among others, were also in attendance, according to the agenda. Sen. Amy Klobuchar (D., Minn.) delivered a video message to the group. David Brock, founder of Media Matters, and Rep. Maxine Waters (D., Calif.) were spotted at the resort, but were not listed in the summit's agenda. The Democracy Alliance's private memo is shown below in its entirety.